It looks like a place. Let's just agree on that. I'd hope they'd look like places. Tha's i' Sco'lan', yer ken? 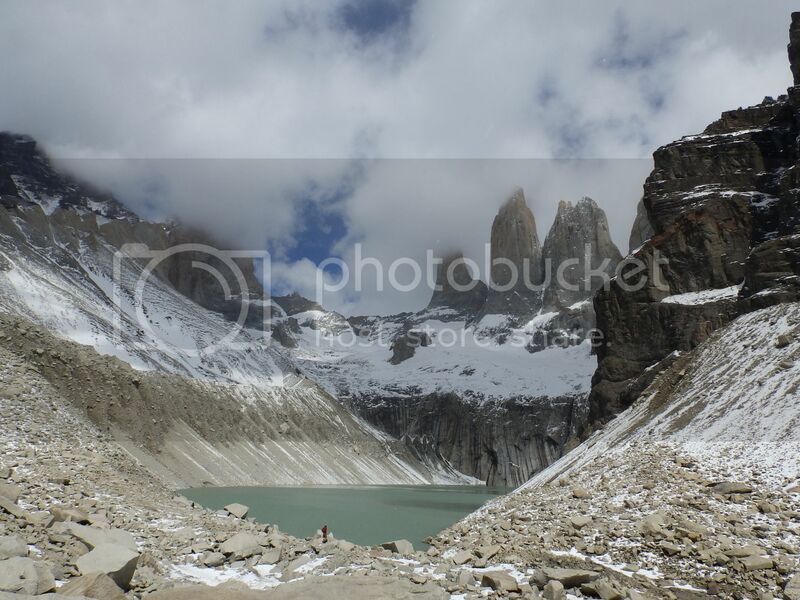 Both the same place, the Mirador Base de las Torres, Torres del Paine National Park, Chile. From Red Pike (755m), looking over Bleaberry Tarn (493m) in the corrie and Buttermere (103m), with Hassness visible among trees on the far side. The near peak on the left is Robinson (737m), and the flattish area in front of it is Buttermere Moss (Moss being a word for a bog up a hill). Behind Robinson on the left are Newlands Valley, Cat Bells (451m) and Derwent Water. Beyond Derwent Water are Castlerigg Fell (590m) and High Seat (608m). Lost to sight beyond that is Helvellyn. The ridge right from Robinson is Littledale Edge, and the peak behind it and behidn Robinson is Hindscarth (727m). The far end of the ridge is Dale Head (753m), and to the right of that is Honnister Pass. The steep thing to the right of Honnister Pass is Fleetwith Pike (648m). Small cars and motorcycles can use Newlands Pass, to the left of Robinson, to get to Newlands Valley. Minibuses have to go via Borrowdale, Rosthwaite, Stonethwaite, Seatoller and Honnister Pass. OS 1:25000 map and Google satellite view of the area shown. There I've been, in fact, except possibly High Seat and Castlerigg, which are on their own little loop of path and can't be combined into a longer ridge walk (unless that purple is "access land," I suppose. I think it's National Trust, but that may not be the same thing). Judgement is a hard place to earn trust. You clearly have a duck addiction, Sniper. You should go to Duckaholics Anonymous meetings. Duck meat would be a nice substitute to orphan meat. Oh no! I totally thought I was in the other thread! heuristically_alone wrote: Is editing cheating? The edit won't get noticed by the score board if it's already counted your post. There, there. We can rebuild. Only 206 to beat. ThemePark wrote: You clearly have a duck addiction, Sniper. You should go to Duckaholics Anonymous meetings. Meh. They're overrated. Plus I like saying the forbidden word. That's pretty much my career for the last 20 and next 35 years summed up! Too bad for the duck. Actually, it's the Ugly Duckling, all grown up. What, you don't like The Ugly Duckling? Well, at least ducklings are prettier than bluebirds.